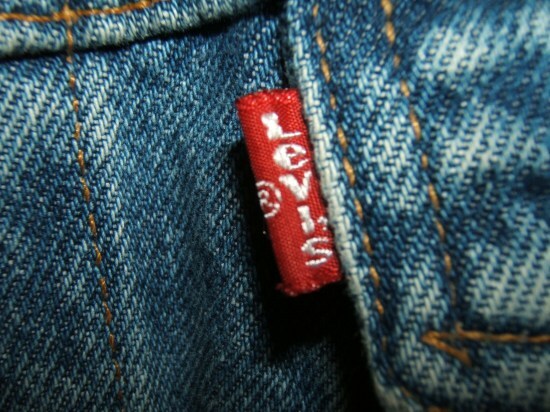 Ever wonder why the trademark symbol on the Levi’s logo is clipped off? Designers and corporate lawyers aren’t exactly known for seeing eye to eye, especially when it comes to trademark symbols. What a designer might think of as an unnecessary besmirchment of a beautiful logo, a trademark attorney might consider the most indispensable element. In the case of the Levi’s logo, though, the designers at Turner Duckworth decided to take the necessary evil of a trademark symbol and totally own it, making it an indispensable element of the Levi’s logo. This video is out of date, and conducted with a Levi’s executive no longer at the company, but it explains a little about the thought process. Created as part of a rebrand for Levi’s back in 2011, Turner Duckworth decided to focus on distilling the Levi’s logo down to the red “batwing” design of the back pocket, which has been a consistent mark used throughout the brand’s lifetime. In previous iterations of the logo, the copyright symbol dictated by Levi’s lawyers was placed underneath the batwing, but Turner Duckworth wanted to figure out a more elegant way of incorporating it. Inspiration struck when Turner Duckworth noticed that the red tag on every pair of Levi’s has the registration mark slightly cropped. Originally, the cropped (R) was due to the fact that there wasn’t any room to fit the registration mark on the small tag, so Levi’s just crammed it in as best they could. But to Turner Duckworth, that truncated trademark symbol represented something they could turn into a signature of the brand. The result? A new Levi’s logo that doesn’t even need to say the name of the company at all to be recognizable. Instead, the brand is recognizable just by the shape of the red batwing, with the folded (R) reinforcing the idea that the shape is meant to represent a pocket on a pair of Levi’s. It’s a smart touch that turns a necessary branding evil into a clever design strength. Levi Strauss died 112 years ago today, and it’s this kind of thinking that shows why the brand has managed to thrive for so long without him. If only all trademarks and copyright symbols could be used this cleverly.